Who is responsible for our neighborhood mailboxes? Each homeowner is responsible for their own mailbox. Can I replace my mailbox with another type? In order to maintain the original character and appearance of Hawk’s Nest as intended and implemented by the Developer, all mailboxes, wood trim surrounding mailboxes, and mailbox posts within Hawk’s Nest shall be of uniform design and construction, and mailboxes and mailbox posts shall have uniform exterior stain. Likewise, all mailboxes shall display the street number of the home associated with its use and such numbers shall be of uniform font, color and size. What if my mailbox was hit by a snowplow? Please contact the City of Dublin for replacement. They will replace with the correct model. What if I need to replace the numbers on my box? 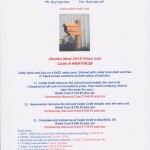 The numbers we use on our mailboxes are not sold locally so the Association’s Landscape Chairperson stocks them. If you have a missing or broken number please send an e-mail to hawksnestdublin@yahoo.com letting them know what numbers you need and they will be replaced at no charge to the homeowner. What if my mailbox flag needs replacing? The original triangular shaped flags that came with our mailboxes are no longer manufactured. The landscape chair has replacement metal flags should yours need replacing. What if my mailbox needs staining? As a courtesy to our homeowners, the mailboxes are stained every other year by the association. This is at no additional charge to the homeowners as it is part of the association’s budget. The next scheduled staining will be in May/June 2015. Should you need to stain your mailbox on a year the association isn’t staining – please contact the Landscape Chairperson to borrow a quart of stain. 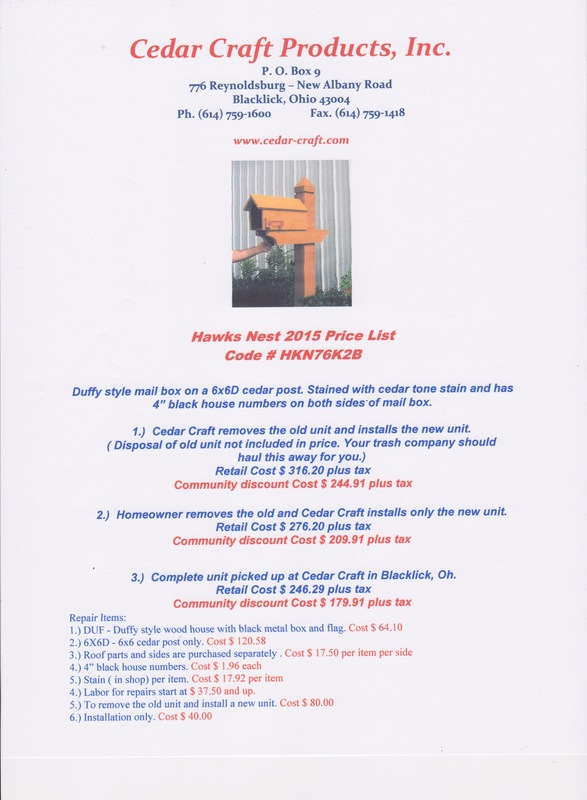 If you would like to own your very own gallon of mailbox stain – you can purchase it from the Creative Paints on Post Road, asking for the “Hawk’s Nest mailbox stain”.